January 4 is the fourth day of the year in the Gregorian calendar.There are 361 days remaining until the end of the year(362 in leap years). 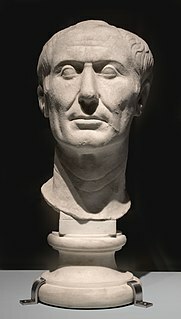 Gaius Julius Caesar, known by his nomen and cognomen Julius Caesar, was a Roman politician, military general, and historian who played a critical role in the events that led to the demise of the Roman Republic and the rise of the Roman Empire. He also wrote Latin prose. Titus Labienus was a professional Roman soldier in the late Roman Republic. He served as Tribune of the Plebs in 63 BC. Although remembered as one of Julius Caesar's lieutenants in Gaul, mentioned frequently in the accounts of his military campaigns, Labienus chose to oppose him during the Civil War and was killed at Munda. He was the father of Quintus Labienus. 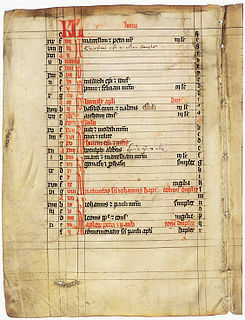 Year 1077 (MLXXVII) was a common year starting on Sunday of the Julian calendar. Emperor Zhezong of Song, personal name Zhao Xu, was the seventh emperor of the Song dynasty in China. His original personal name was Zhao Yong but he changed it to "Zhao Xu" after his coronation. He reigned from 1085 until his death in 1100, and was succeeded by his younger half-brother, Emperor Huizong, because his son died prematurely. Year 1334 (MCCCXXXIV) was a common year starting on Saturday of the Julian calendar. Year 871 (DCCCLXXI) was a common year starting on Monday of the Julian calendar. Æthelwulf of Berkshire was a Saxon ealdorman. In 860 he and other men of Berkshire fought off a band of pirates near Winchester, Hampshire. Later he mustered a force of 1400 men against an army of Danes, won the 31 December 870 Battle of Englefield on behalf of the then kingdom of Wessex. He received a land grant in 843/44 from Brihtwulf, king of Mercia; and lost his life at the Battle of Reading. Ealdorman was a term in Anglo-Saxon England which originally applied to a man of high status, including some of royal birth, whose authority was independent of the king. It evolved in meaning and in the eighth century was sometimes applied to the former kings of territories which had submitted to great powers such as Mercia. In Wessex in the second half of the ninth century it meant the leaders of individual shires appointed by the king. By the tenth century ealdormen had become the local representatives of the West Saxon king of England. Ealdormen would lead in battle, preside over courts and levy taxation. Ealdormanries were the most prestigious royal appointments, the possession of noble families and semi-independent rulers. The territories became large, often covering former kingdoms such as Mercia or East Anglia. Southern ealdormen often attended court, reflecting increasing centralisation of the kingdom, but the loyalty of northern ealdormen was more uncertain. In the eleventh century the term eorl replaced that of ealdorman, but this reflected a change in terminology under Danish influence rather than a change in function. Saint Ferréol (Ferreolus) of Uzès was bishop of Uzès and possibly bishop of Nîmes (553-581). His Feast Day is January 4. Mavilus, distinguished as Mavilus of Hadrumetum, was an early Christian martyr during the persecutions of Caracalla. He suffered martyrdom at Hadrumetum, in 212, by being thrown to wild beasts, by order of Governor Scapula. Saint Pharaildis or Pharailde is an 8th-century Belgian saint in Roman Catholicism, and patron saint of Ghent. Her dates are imprecise, but she lived to a great age and died on January 5 at ninety. Angela of Foligno, T.O.S.F., was an Italian Franciscan tertiary who became known as a mystic from her extensive writings about her mystical revelations. Due to the respect those writings engendered in the Catholic Church she became known as "Mistress of Theologians". Elizabeth Ann Bayley Seton, SC, was the first native-born citizen of the United States to be canonized by the Roman Catholic Church. She established the first Catholic girls' school in the nation in Emmitsburg, Maryland, where she also founded the first American congregation of religious sisters, the Sisters of Charity. November 1 is the 305th day of the year in the Gregorian calendar. There are 60 days remaining until the end of the year. ↑ Evelyn Shirley Shuckburgh (1902). A History of Rome to the Battle of Actium. Macmillan. ↑ Mark Grossman (2007). World Military Leaders: A Biographical Dictionary. Infobase Publishing. p. 13. ISBN 978-0-8160-7477-8. ↑ New Encyclop3Œdia Britannica: Macrop3Œdia. Encyclop3Œdia Britannica. 1997. p. 501. ↑ Political Handbook of the World. Center for Comparative Political Research of the State University of New York at Binghamton and for the Council on Foreign Relations. 1963. p. 89. ↑ Anil K. Maini; Varsha Agrawal (29 January 2007). Satellite Technology: Principles and Applications. John Wiley & Sons. p. 8. ISBN 978-0-470-03335-7. ↑ Michael Gray (4 January 2011). "Gerry Rafferty obituary". The Guardian. Retrieved 28 February 2019. ↑ Roger Nichols (5 January 2017). "Georges Prêtre obituary". The Guardian. Retrieved 28 February 2019. ↑ McFadden, Robert D. (January 5, 2019). "Harold Brown, Defense Secretary in Carter Administration, Dies at 91". Wikimedia Commons has media related to January 4 .